Let's Get Out Of Here! 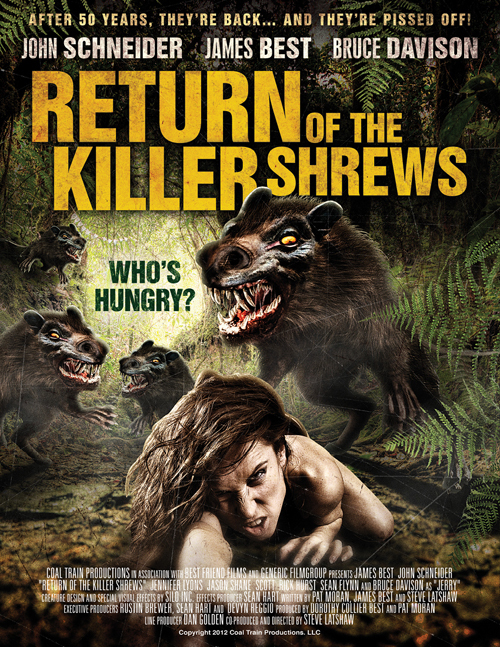 : Killer Shrews Sequel Update from Director Steve Latshaw! Well, as you will see below - not ALL CG, Kaijinu! that's what they said in The Thing 2011, but okay! But, it's the film's director telling you! haven't seen the original, but I'll try to check it out in the future. Maybe I could do a double review when the sequel's finally out. Oh that would be a great post! Looking forward to that one! Looks like they had a blast with this--and huzzah for Latshaw being an SIUC guy! Actually, we filmed the entire movie in Hollywood... at Marina Del Ray, Bronson Canyon and out in Soledad Canyon, near Newhall. We did the premiere in Tennesee because one of the cast members (David Browning) is from there. It was a benefit. Out in Soledad canyon we recreated the original Killer Shrews compound, with the squat ranch style building and wooden fence... and recreated the living room/bar set from the original film inside the building. Fans of the original movie will be impressed, I think. It was very much Deja Vu for James Best, care of our set design genius Billy Jett. Billy built a lab set inside the Bronson Canyon caves that was amazing. And for the fans, in addition to CGI, we also had a "live" shrew puppet for certain sequences... we couldn't make this movie without showing the shrews trying to gnaw ther way into doors and under fences. Go FIghting Salukis! If we ever find ourselves in Carbondale again at the same time (not the most likely event, I know...) I hope I can treat you to a Quatro's pizza (still there a year or so ago and still terrific) and a pitcher. You don't know how much I wish we'd been introduced back in the 80's - it would have been cool to see you guys at work on those productions and maybe to pitch in somewhere. Can't wait to see this movie - even as a screener if you're looking for pre-release reviews... Thank you again Mr. Latshaw. Yay!!! I am sooo excited for this. The original is one of my all time fave monster movies. Man, I wish Columbus IN was closer so I could get to the B Movie Celebration. I hope it gets wider distribution. I'll have to do a piece for Static Multimedia, get some press around Chicago. The original is an underrated movie - I knew you'd enjoy this update, Mel - did you see the incredibly cool offer from Mr. Latshaw? Melissa, Craig... email me privately at stlatshaw@aol.com re: screeners. Craig - I'd love to have a slice at Quatro's... I had my very first slice of Casrbondale Pizza at Quatro's Pizza in August of 1977, right after visiting the record store just around the corner, which name escapes me. I used to love those giant quarter slices of pizza from COVONE'S.. on up the street. Great cheese. There were always great eats on The Strip - did you frequent Pagliai's (sp) or the Greek restaurant that introduced me to gyros? I have sent the email, by the way - thrilled for the opportunity! Oh my gosh!! Thank you so much. I would love, LOVE to screen this. I am sending my email ASAP.